It was probably a year or so before the first Spider-Man movie with Tobey Maguire and Kirsten Dunst was released when my then-girlfriend, now wife and I were at my parents’ house on a Saturday night for dinner. Typically, my mom always puts some coffee and dessert out after dinner and my father would stay at the dining rom table for a few minutes before retiring to the bedroom and zonking out. After he would leave, my mom would always open up a bit more around this other woman who was now commanding so much of my attention. The conversation focused on my mother’s co-worker whose Queens, NY, house was used as part of the set for the film. She met the cast and crew, and even had a piece of cake in honor of Dunst’s birthday. I was obviously fascinated by this story, but as my excitement continued to mount, I realized I never really told my girlfriend about my collection. At that point, I hadn’t purchased a comic in years — this was one of the longer collecting gaps in my life. But it’s also the set-up for a major renaissance for my old hobby. I knew my girlfriend wasn’t going to be too put off by the fact that I collected Spider-Man comics. She was never the type to put down anyone for something like that, but this was still a big leap for me all the same. It was unlocking a piece of my childhood — and a past that I wasn’t necessarily done with. While I knew as a 13-year-old collecting every single Amazing Spider-Man was an impossible goal, I did more-or-less give-up, and without a particularly good reason (unless you count lack of funds as a reason). There was one specific issue missing from that pile — one that really bugged me. 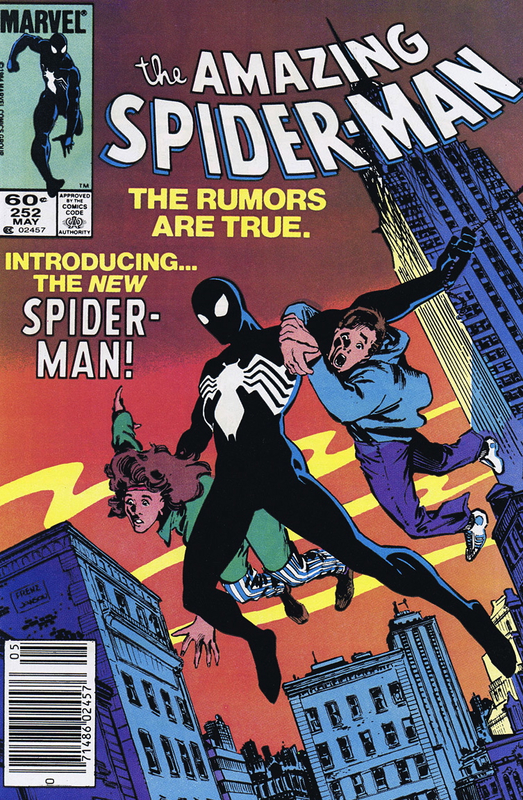 Granted, at that point, there were hundreds of issues that had gone uncollected, but Amazing Spider-Man #252 was a key issue that came out in my lifetime — 1984. Yes, it was before I was buying comics with my weekly allowance, but when I was in my initial buying craze in junior high, it’s an issue that I should have picked up. It wasn’t a terribly expensive comic, and the storyline kicked off a years-long arc that culminated with the origins of my favorite villain of all-time, Venom. 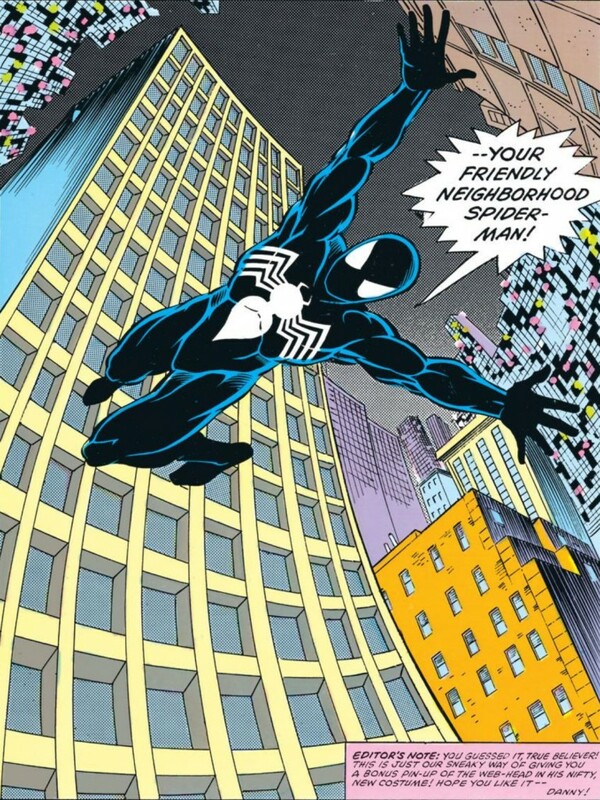 ASM #252 was the first Spider-Man ASM appearance in his brand new black suit. Of course, in retrospect, a move like a new-suit totally smacked of a marketing ploy centered around rebranding a stale character, but at least in storyline terms it all went somewhere. 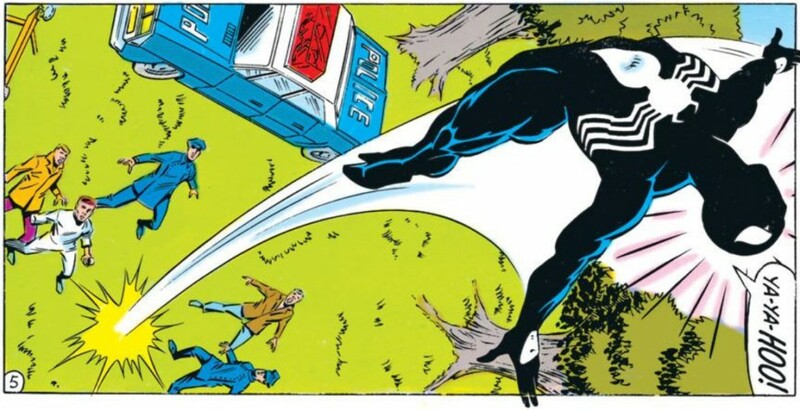 The actual, actual first appearance of the black suit came in a Marvel mini-series “Secret Wars.” I was obsessed with “Secret Wars” as a little kid. The series was essentially a Marvel character battle royal, good versus evil with every single character of significance in the fight. In issue #8, Spider-Man is beaten down and his traditional red and blue costume is tattered. A strange black goo crawls up his hands and becomes his suit. Spider-Man feels great with the foreign substance — how could a strange black goo that takes over your entire body possibly be evil? — and a new suit is born. I had all of these “Secret Wars” comics as a little kid, but I trashed them. I even had the action figures. And strange enough, the black Spider-Man is currently sitting in my mother’s kitchen over the sink. I recently asked her why she has it there, and she said she was gardening a few years ago and found him buried — perhaps I was trying to reenact the storyline where Spider-Man is buried alive by Kraven? She thought it was funny, and since I was the Spider-Man nerd growing up, sitting him up on the counter there is a perpetual reminder of what a little goon I was/am. In the weeks following my big reveal to my girlfriend, I would wander onto eBay to see how much Spider-Man comics were selling for. And I’d keep routinely going back to #252. Again, there were more significant and expensive comics out there, but it just felt wrong that I didn’t own the stupid thing. Months passed and I still wasn’t ready to dive in head first, but then my girlfriend came back with an offer that I couldn’t refuse. She had been working for more than a year at a New York City nightclub as a bartender and door security guard. I would routinely go visit her there because it was an opportunity to hang out on a Friday or Saturday night, plus it was the only way my under-21 behind was going to get served a drink. The staff at this place was always a quirky bunch – bouncers with biceps bigger than my head. A guy, who I don’t even think actually worked there but hung out there every night in a suit called “Well Dressed Mike.” These guys were all great to me, even if I sometimes wondered if they would have been the same guys stuffing me into a locker years earlier during junior high. Regardless, my collection and I are totally indebted to one of them — a guy who I don’t even remember meeting in the flesh, but was captivated by my story all the same. I imagine my girlfriend and this guy were shooting the breeze one night while working security in front of the club. He was an aspiring comic book artist, so she probably told him about my old collection and how I once set out “to collect every Amazing Spider-Man.” He mentioned that in his spare time, he worked at a comic book shop in Manhattan, and he would look into using his “employee discount” to get me a deal. When my girlfriend shared the news, I was skeptical, but still intrigued. He wanted a list of every comic I owned so there wouldn’t be any doubles. “Whatever,” I thought. At best, he’d probably pull out the same 30-40 issues that I had already picked up during comic book boon of the 1990s. I gave the list to my girlfriend and on a whim mentioned, “see if he can grab me ASM #252.” I was sure he couldn’t. The following week he showed up at the club with a “short box” (which holds about 100 comics) stuffed with issues from the 1980s and 1990s. My girlfriend was stunned by the vast amount of comics and when she asked him how much we owed, he took $50 and called it a day. He refused to take more. Was this even legal? I sifted through the box and pulled out key issue after key issue from the 200s and 300s. The first Hobgoblin (238), the death of the Burglar (200), the first Todd McFarlane (298). I couldn’t believe it. All of these comics for $50? And sandwiched in the middle of the box, stuck in there like it was just any other comic — and in retrospect, I guess it was — #252. There in all it’s glory. “Introducing the New Spider-Man” splashed across the cover. The inexplicable absence of ASM #252 was no more. More importantly, my once dormant collection had been reinvigorated in a way I never expected. My collection had more than doubled instantly, and suddenly the idea of actually going for the whole damn set wasn’t so farfetched. I had some considerable buying to do in the first 200 issues of the series, but I realized I know had far fewer holes to fill. Getting a boost like that for so little in return still baffles my mind to this day — that someone I didn’t even really know, who was just a co-worker and friend with my girlfriend, would do that for me. There are certain people in your life who you expect some measure of generosity from. Then there are people like this who are here and gone in an instant, but still make such a tremendous impact that you’ll never forget them, even if you can’t recall what they looked like. Last summer, after issue #600 came out and I had amassed enough older Spidey’s in the first 100, my wife suggested I designate one box for every 100 issues to better organize my collection. That way, I wouldn’t have to take comics in and out of boxes every time I got a new issue to place in its proper order. The box all of those comics were delivered in a few years before had such a distinctive look. It’s significantly more aged than the others, with some yellowing and rounded corners. And there’s a note taped to the top of the box — written on the back of a folded-up set list from the club’s performance that night — telling people that the box was off-limits for anyone but my wife (written much more colorfully than that — I believe a word that rhymes with trucker was used). As I followed my wife’s advice on the comic organization, I thought it was only fitting that this box would hold the prized first 99 issues of Amazing Spider-Man. This would be the box that would eventually hold the holy grail, issue #1 (provided I ever get my paws on a copy without having to sell my soul in the process). And when (if) that day comes, when I’m taking #1 out of that box to admire it, I can thank my childhood fascination with a black Spidey suit. I remember your reaction so well from when I gave you the box. It was more comics than I had expected, but M. (the man who procured the comics) was so nonchalant about it, I assumed it wasn't *that* big of a deal. You looked like a kid on Christmas. Not only was Erin super cool and patient with me as her door person, I profoundly related to your focused and nearly impossible desire of collecting comics. Yours was a plan I could help come closer to fruition, especially with my 'insider rates' (which are far, far removed from guide listings). Funny how I was thinking about those comics the other day, wondering if you were still in search of the Holy Grail, or at least still collecting. Glad to discover you still are. And that #600 was good, huh? It was definitely Christmas. I was sprawled out on the floor reading going through that box one by one, amazed with every discovery. Meanwhile, I'm less than 30 issues away from the Holy Grail Zegas! Very much enjoyed your tale, Mark. I remember the Kraven storyline. My cousin had given me a bunch of comics he didn’t want anymore. And that one showed me that Spider-Man could be as dark as the Dark Knight himself. I personally love the black suit so much more (more spiders are black, it’s more practical for sneaking around and catching crooks, and it just looks super f*ing cool.) Great stuff buddy. But if I ever go to NY, please do ontroduce me to girl who’d respect an encourage a comic book fan – specially a spidey fan. But if I ever go to NY, please do introduce me to a girl who’d respect an encourage a comic book fan – specially a spidey fan. As to issue: I was stunned and do excited about it; incredible reading for any Spidey fan. I went through a brief comic book collecting phase in my early teens. Several months ago while visiting my parents, my father made me clean out all the books in the knee wall space behind my closet, take what I wanted, and put the rest in a box to be sold. I was pleasantly surprised to find all my old comic books. I took them home and relived my childhood by re-reading all of them. A couple of weeks ago my parents came by because I was sick with a fever, and my dad commented on what a mess my apartment was (hey, I had a fever of 102.4), and mocked me for having a stack of comic books on the floor. (Not a good place for them, I know; I had been reorganizing my stuff but had not yet found a good place for them.) I reminded him that he made me clean out all the books from my closet, and said “I’m sure as hell not going to throw them away.” My mother backed me up and referenced “The Big Bang Theory” to support the importance of comic books as collectibles. So after your comments on Amazing Spider-Man #252, I thought “Do I have that one?” I just checked the stack, and sure enough I do. I feel weirdly satisfied to know that I have such a “key” issue in my little collection. It’s sort of funny (and a bit sad) to think that while you were searching for that issue, my copy was stuffed away in a dingy, musty old knee wall space.